So I thought to myself, what’s more fun than doing a video/screencast review? The answer: waiting for about three hours while the video encodes in Windows movie maker and still doesn’t have the decency to register on youtube as HD compatible. Seriously, before I do one of these again, I am going to have to invest in some better software for video editing. At any rate, I present you with my first ever video review. 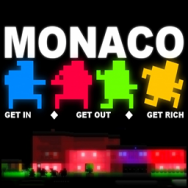 Up on the block is Monaco: What’s Yours is Mine. I don’t want to pre-empt myself too much; however I will say here that this is a top-down stealth/heist game from indie publisher Pocket Watch Games. And do feel free to leave me some comments on what I could have done to improve on this review. I already have some thoughts in mind on what I might do differently for my next video review. No love for FREEDOM SPOON?